Black Diamond Camalot C4. That’s right. BD did it again. Behold the new, redesigned Camalot C4. 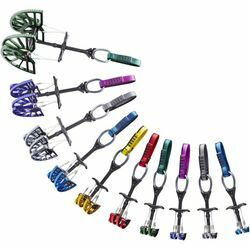 Now 10% lighter, these bad boys have eclipsed the classic, cornerstone cams, and feature a more modern design that gives climbers everything they love about the old Camalots but add new touch-points like a wider trigger for easier handling, and BD's innovative trigger keeper for compact racking with sizes #4, #5 and #6.